This past July, former UFC star Nate Marqurdt (Pictured) signed a multi-fight contract to join BAMMA. Fast-forward just six months and his stint with the British mixed martial arts promotion has ended before it ever began. Marquardt requested and was granted his release from the organization after they postponed their February 11th event until March 24th. “Nate the Great” was slated to headline the card opposite Yoshiyuki Yoshida for the vacant welterweight title. It marked the second time BAMMA delayed Marquardt’s highly-anticipated debut, as he was originally slated to premiere this past December. “Nate is disappointed that he has not been able to fight for BAMMA and the UK fans,” expressed manager Lex McMahon in a press release. “However, given the situation that BAMMA removed him as the headliner from BAMMA 8 and have elected to reschedule BAMMA 9 to March 24th all parties concerned feel that it is in Nate’s best interest to explore other options at this stage. Marquardt was scheduled to headline “UFC on Versus 4” against Rick Story, but was abruptly pulled from the show just minutes before the official weigh-ins because he failed to meet the medical requirements issued by the Pennsylvania State Athletic Commission. Shortly after the controversy, Marquardt revealed the Testosterone Replacement Therapy he was medically prescribed triggered him to register high levels of testosterone and flunk his pre-fight medicals. It was the second time he had failed a drug test under the UFC’s watch. UFC president Dana White immediately fired Marquardt and later suggested the controversial fighter may have used TRT as a performance-enhancer. Now that the 32-year-old is once again a free agent, expect for the Bellator Fighting Championships chatter to begin shortly. 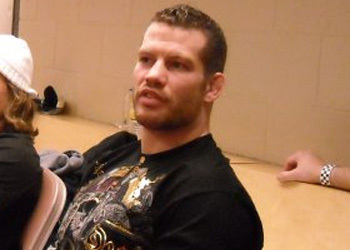 Bellator middleweight champ Hector Lombard called Marquardt out the second he was released from the UFC. Marquardt owns an impressive 31-10-2 professional mixed martial arts record.